Oh, and I'm auctioning off my wig. Bid starts at $50 and all proceeds will go towards the Susan G. Komen Foundation. Get a haircut...clean the ocean! Ever wonder what happens to your hair after you get a trim at the salon? In most cases it simply ends up in our waste streams. But, for a progressively green selection of salons that are starting to turn up, their hair trimmings are cleaning up our oceans and our beaches. A company called Matter of Trust is on the forefront of this movement. They are currently working with a variety of hair salons across the country, taking their hair trimmings and turning them into “oil spill hairmats”. When the hair trimmings are collected they are weaved into highly adsorbent mats (as in "clings to" unlike absorbent which is to "soak up"). These mats are used on beaches and oceans across the country to clean up oil spills. Have you ever noticed how greasy your hair can get? I know I have. But then again, I rarely shower. Gotta keep it green! The reason human hair gets so greasy is because it is very efficient at collecting oil. While this may be considered slightly unsanitary for some, it makes human hair ideal for cleaning up petroleum spills. These hairmats are also very efficient for drip pans during oil changes or under leaky cars, and as booms for storm drains. After the hairmats are used they are broken down and used as fertilizer. That is some truly effective recycling! I have to give a shout out to the person who introduced me to this very cool process, Nicole Leal. She currently works at The Doves Studio in Santa Monica, where she, with the help of the salon’s owner Sonya, implemented the collection of hair trimmings and distribution to Matter of Trust. Nicole is an active environmentalist/blogger/hair stylist/make-up artist and all around awesome person I recently met at the 2009 Sustainable Works “Tomorrow Starts Today” Fundraiser, where she was recognized and awarded for her tireless environmental efforts. For more on Nicole check out http://www.greenmeetsgirl.blogspot.com/ and http://www.nicoleleal.com/. She flippin rocks! By Erik Lingvall - Green Guys Los Angeles, Everywhere U.S.A.
Not only am I a hairstylist, but I also teach color/haircutting classes. For every class that I teach through the Doves Academy a portion of the proceeds gets donated to a non-profit of my choice. Not only are the stylists that attend my classes getting exposed to the newest trends, but they are also giving back. My Sept. 20th, 2009 color/haircutting class supported Sustainable Works. Thanks again to Bruce and Kimi and the many other stylists who will have the opportunity to support several non-profit organizations to come! Malin Karki, an 18 year old student from rural Nepal, was inspired by a Stephen Hawking book to harness static energy from hair, using melanin as a conductor. After creating several hair-powered prototypes that charged a cell phone and battery pack, Karki created a solar panel that uses human hair, rather than more expensive silicone, as a conductor. Karki’s creation could slash the price of solar panel production dramatically, and help bring affordable and renewable energy to developing nations—hair is, after all, a renewable resource that could be replenished by the owner of the panel as it wears out. To read more about this incredible discovery, see this article at the Daily Mail. Green Meets Girl is an Eco-Star! 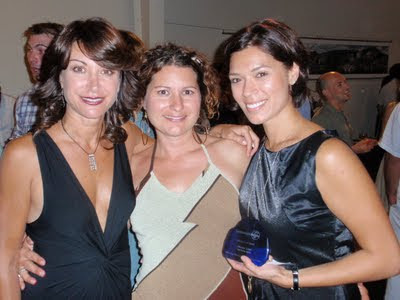 I was honored the Sustainable Works Eco-Star Award at the Sustainable Works Fundraiser!! !Since the Doves salon opening in 2007, I have been an inspiration and leader in making our business green! I have organized monthly salon beach clean-ups for the adopt-a-beach program and have dedicated a lot of my time to teaching our team how to save energy and recycle materials with the help of the Santa Monica Sustainable Works team. My dedication to the environment doesn’t stop when I leave the salon. Nicole Leal on Santa Monica CityTV's "Be Green"
Thank you Sheila for my eco-gift! This all-in-one basil kit is amazing. Everything you need is included (soil, seeds, and a growing pot). I'm looking forward to having basil in a couple of weeks. Over the summer I have been growing lettuce in my patio. It's convenient, easy and taste great in sandwiches. On Thursday, Sept. 24th we will be hosting a Green Living 101 workshop for Sustainable Works from 6:30-9:30pm.